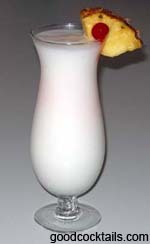 In a blender combine the vodka, piña colada mix and pineapple juice with crushed ice. Blend well at high speed and pour it into a hurricane or collins glass. This is like a Piña Colada but instead of rum you use vodka.